Well as far as reading quantity goes, 2009 was a bit of a shank. If I learned one thing is that I am not able to predict my own behaviour. I started off the year with a bang and was cruising through books, with no sign of stopping (read 11 books by February 24). And then it all came crashing down. My usual spring drop-off turned into a complete embargo. I have some explanations, but ultimately it boils down to a lack of will and focus. I got way too into gaming this year and as there was a lot of really interesting products this year, I spent a lot more time reading RPG books (which I tend not to read straight through or completely, so don't consider them as a book for counting purposes) and planning games than reading books. Life was busier as well. I got married in September (hooray!) and the planning took up a lot of time. My job became quite busy as well as we were leading up to the Copenhagen talks on climate change and had a lot to do (thanks for shitting the bed on that one, world leaders and especially you Harper and co. you shitheel scumbags). Quantity aside, I enjoyed almost everything I read this year and was particularly happy to re-start the Parker books. I hope to get the next three in the series for my birthday this year and continue my longer analyses of Westlake's masterpiece. We also did a couple of "book clubs" where most of the people on the list to the right chose a single book and all read it together. Those were quite fun and I wouldn't mind doing it again. I think the comments lacked a bit of energy because we all tend to have a similar opinion and those don't generate a lot of conflict. Maybe a more contentious pick this year if we decide to do it again? I have a lot of goals and projects in my life this year, so I'll make no reading commitments for the '10 except one: to get a blog post written as soon as I finish the book. No more falling behind this year! 27. 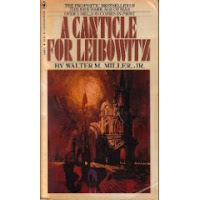 A Canticle for Leibowitz by Walter M. Miller jr.
A classic of the post-apocalyptic genre, A Canticle for Leibowitz has been on my stagnant on deck shelf for months. I figured it would be good to read during the pre-xmas vacations. It's too strong to say that A Canticle for Leibowitz doesn't actually fit into the PA genre. But it does feel much more like classic sci-fi. It takes place far in the future, after a civilization and knowledge-destroying nuclear war that sets humanity back to the dark ages. I use the term Dark Ages precisely because the author deliberately sets it up so that the church is the last and only outpost for knowledge, where little bits of information are stored as relics and artifacts from a past age, both to be worshipped and copied. The book takes place in the three parts, covering three periods, each separated in time by several generations, as humanity slowly reclaims the knowledge it lost and starts to make the same mistakes again. The book is well-written and despite the over-arching themes, each segment contains rich characters and their own compelling storyline so that you get quite caught up in the book. It has some nice touches of black humour as well. It ends up achieving a nice balance of lightness and heaviness while making you think about our relationship with knowledge and humanity's progress such that it deserves its reputation as an all-time science fiction classic.